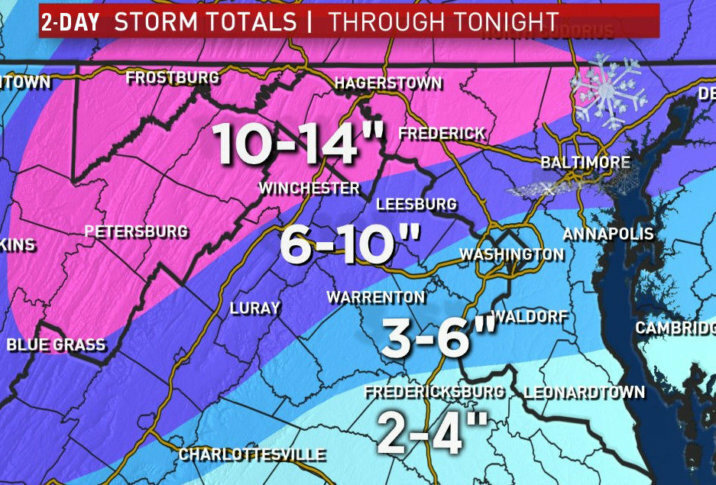 WASHINGTON — The spring snowstorm of 2018 is crawling out of the area, and its aftermath will linger around the D.C. area through the night and into the Thursday morning commute. At about 10:20 p.m., Storm Team4 meteorologist Doug Kammerer said that snow and a snowy drizzle — “snizzle,” he called it — had begun to fall again in some spots in the D.C. area, including around I-66, I-95 and I-270. Temperatures will drop below freezing overnight, resulting in slick surfaces through until morning, and some major school systems have announced they’ll remain closed for a second straight day. The federal government in the D.C. area will open two hours late on Thursday, and employees have the option of unscheduled leave or unscheduled telework. WTOP’s Bob Immler said at about 7:30 p.m. that it was “a very calm evening” on the roads, including the major highways, but warned that smaller roads, as well as bridges, ramps and overpasses, could freeze and become slick. Storm Team4 meteorologist Amelia Draper said at the same time that the snow had tapered off to just a few showers, which would end around midnight without any more accumulation. Meteorologist Mike Stinneford said that the wind would pick up and temperatures would soon fall into the 20s, turning slushy, wet snow into ice. Also, be wary of raised surfaces such as bridges, as well as areas near puddles, he cautioned. “If somebody drives through a puddle and tracks it around the corner, that may well freeze,” Marbourg said. The key factor, he said, is whether winds pick up before temperatures drop. Tolls will be suspended on the 495 and 95 Express Lanes in Virginia from about 10 p.m. Wednesday until 5 a.m. Thursday. the idea is to get more people driving on the lanes, to warm up the pavement and improve the effectiveness of the ice melt. A low-pressure system off the coast of Delaware is doing its part to end the spring snow, said Storm Team4 meteorologist Matt Ritter. High winds blew down trees along the Baltimore-Washington Parkway between Maryland routes 410 and 198, said WTOP’s Reada Kessler. Other incidents in Maryland included jackknifed tractor-trailers that closed Interstate 95 at Maryland Route 32. Maryland’s State Highway Administration officials have deployed more than 1,000 personnel and more than 2,300 pieces of equipment to clear and treat the roads. Wednesday morning saw a spate of accidents across Virginia — state police dealt with more than 240 traffic crashes between midnight and 8:45 a.m. The majority of the crashes have only involved damage to vehicles. There have been no reported traffic fatalities. D.C. Mayor Muriel Bowser has declared a snow emergency until 7 a.m. Thursday. Motorists may not park vehicles along corridors designated as snow emergency routes, which are posted with red and white “Snow Emergency Route” signs. To find a towed vehicle, call 202-727-5000. Comcast has offered to help residents in the D.C. area stay connected during the storm by opening more than 3,500 Xfinity WiFi hotspots at select outdoor and business locations. This free service is available to anyone — including non-Xfinity internet customers — through Monday, March 26. All major school systems in the region were closed Wednesday. Fairfax, Loudoun, Fauquier and Prince William County public schools, in Virginia, and Frederick County in Maryland, have announced they’ll be closed on Thursday too. Several systems have announced delayed openings as well. A complete roundup of up-to-date information on school delays and closings is on WTOP’s Closings and Delays page. Metro trains are running on a modified schedule, every 12–15 minutes. (The Rush Hour Promise is not in effect.) Metro buses will only be operating on major roads as part of their emergency snow plan. for the rest of Wednesday. Metro announced Wednesday night that full bus service would resume at 4 a.m. Thursday, with the exception of any specific required snow detours. Rail and MetroAccess service would run as normal. Read more about the forecast’s transit impacts. VRE said Wednesday evening that they will announce their service plans for Thursday by 4 a.m. As of 8 p.m. Wednesday, MARC said trains would run on an R schedule Thursday. But they’ll decide by 4 a.m. Thursday whether that holds, or whether they’ll cancel service completely. All MARC and VRE train service was canceled Wednesday. MTA Commuter Bus Service did not operate, except Route 201, which operated on regular weekday service. Dulles International Airport and BWI Marshall Airport are advising travelers to check with their airlines for up-to-date flight information. At Reagan National Airport, delays and cancellations are possible throughout the day and tonight. Officials encouraged passengers to monitor the status of their flight before coming to the airport. Check WTOP’s traffic page for updates on weather-related accidents and road closures. As of Wednesday afternoon, a few thousand customers around the area had reported losing power. Monitor any reported outages in the map below. Listen live on WTOP.com, on the WTOP app or by tuning in to 103.5 FM. WTOP’s Chantalle Edmunds and Nahal Amouzadeh contributed to this report.